Visitors to our church may have noticed the effects of damp in the Relic Chapel. This was caused last year when a newspaper blew into the gutter on the roof of the chapel, shortly after the annual inspection of the drains and gutters had taken place. We have now had larger, sturdier downpipes installed below the roof area, and the peeling paint on the ceiling is due to be renovated this week. 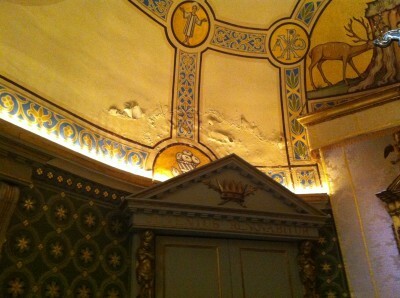 So the Relic Chapel, and Our Lady of Oxford's shrine, should be restored again to the pristine beauty in which they stood after the major restoration in 2009.